When Build Health International (BHI) needed a helping hand in Mirebalais Haiti, they turned to the International Standards and Training Alliance (INSTALL). The global non-profit builds healthcare facilities by blending North American design and system aspects with systems, materials and building techniques appropriate to the resource-constrained environments where they operate. Haiti is home to BHI’s Mirebalais Hospital which serves as the primary care option for nearly 185,000 residents in the surrounding community and sees upwards of 700 patients per day. While it first opened in 2013, the facility recently underwent a large expansion that saw the construction of a new national pathology and microbiology reference laboratory. 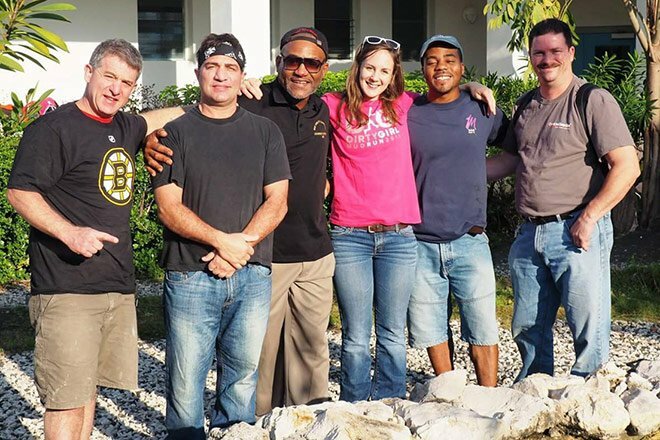 When BHI asked for support with the new pathology and microbiology laboratory, INSTALL lent a helping hand by recruiting six trained installers who traveled to Haiti for a total of six days. There, they helped manage the flooring installation process and worked to install thousands of square feet of material. The installation team included David Young, Steve Seda and Megan Dant. Not only did INSTALL members help manage and complete the project, they passed their knowledge along to local workers. BHI contracts local craftsmen and workers to help build the local economy and leave a lasting positive impression on the community. While the flooring installation at Mirebalais required professionals to be brought in from the U.S., the INSTALL team made time to train the local workers and pass along advanced technical skills they received through INSTALL training.